THE BOOK… doesn’t just have groundbreaking articles on developing the solar system economy this century, and how to envision starships as a goal of those next 100 years. It has fiction too. 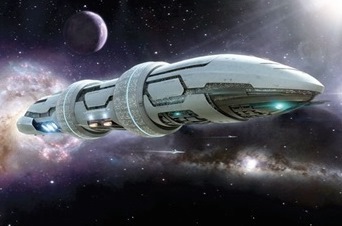 One is a tightly argued piece by David Brin on the pressures of generation ships—huge expeditions that will take centuries to reach colony worlds. Generation starships have a long history in science fiction, mostly because they allow stories featuring societies evolved in wholly artificial habitats, and the cultural problems that emerge. This story looks at what happens when such a ship finally arrives. Way back during the golden ages of science fiction, we envisioned our descendants setting forth in great space-conestogas, crossing a spatial expanse that might be dangerous, but only as frighteningly sterile as the plains or desert or ocean, then arriving at some frontier world no more hostile than the Americas seemed to Europeans. Perhaps fraught with monsters, or dinosaurs, or autochthones who variously earned respect, awe, guilt or pity, depending on whatever axe the author wanted to grind. But at least the air could be breathed, the water used for washing and drinking, and the sunshine withstood by the hardy. In all likelihood, few of these assumptions will hold true out there — even when we find nice, warm, watery worlds with nitrogen-oxygen atmospheres. For one thing, such an atmosphere can only have been produced by life… locally evolved and far more fit for local conditions than our dauntless settlers will be. Either the local biome will be incompatible with ours, in which case there will either be conflict or parallel ecosystems – or else compatibility will mean we can find plenty to eat in the new realm… but then they will be able to prey on us. That would include disease. There is more. We are now pretty sure that each living world will strike its own “gaia balance” of greenhouse gases that are just right to maintain liquid seas. Which means most such worlds will have places where our settlers can visit in shirt-sleeves. That’s the good news. But the price will be a wide range of percentages for carbon dioxide in the air, a gas to which human beings are very sensitive. We move on. We evolve. Those quotation marks around “suitable” imply criticism of the golden age authors who envisioned an endless frontier like the Olde West. Perhaps those who already live on the new worlds – even microbes – deserve some passing consideration. Even a place in the new order of things. There is, of course the other alternative. To modify ourselves. To meddle in our own genes and natures to become (or to help our children become) better suited to the new worlds we plan to pioneer. Not enough tales in science fiction deal with this far more likely prospect, though Clifford Simak touched on it, long ago, in his great collection, City. Both terraforming and alteration of humanity are portrayed in Kim Stanley Robinson’s Red Mars trilogy, and I do a little in Existence. This story – “The Heavy Generation” – takes on many of the gritty aspects of generation ship colonization that were glossed over in earlier (terrific) explorations like Alexei Panshen’s Rite of Passage. That is how our thought experiments improve, by each generation probing at gaps not envisioned by those who came before. So it is in fiction, and so it shall be as we head out there to the stars. The process won’t be as simple or easy as we first dreamt. This entry was posted in Blog, Excerpts and tagged 100yss, David Brin, Greg Benford, ship colonization, space travel, starship century, Terraforming by Gregory Benford. Bookmark the permalink. Nice mini-essay David. There are means of speeding up the terraforming process for both Venus and Mars developed by the late Paul Birch – as Stan Robinson depicts, with varying degrees of fidelity, to the original plans. The time-scale, given a suitable interplanetary economy, might be compressed into mere decades, rather the oft quoted “15,000” years for Venus and “100,000” years for Mars. Even just improving the atmosphere somewhat makes inhabiting them far easier – giving Mars more CO2 would make it warmer and wetter, and making it wetter will also release O2, in significant amounts, once the soil reacts to sufficient depth. Such a change could be completed almost overnight if a sufficiently large asteroid energised the polar caps. Or a high-speed comet. One wonders what Mars will be like after the impact of the comet, C/2013 A1 (Siding Spring), next year – if it impacts. The odds a very low now, but some dramatic non-Keplerian motion by the comet might surprise us still. What a gift to humanity, if it does. WHAT a story idea, Adam! Generation starships? OK Peter Schwartz said that the evangelical Christians and the extremist Muslims may support them as the new Conquistadors when we have 36 billion miserable souls on this garbage planet gone to Hell by 2300 – in one of his scenarios. Of course, I prefer the trillionaires in space scenario with a stable 2.3 billion secular humans living the good life and extremist religions on the trash bin of history. Trillionaires will opt for faster-than-light warp drive and also even better star gate traversible wormhole metric engineering using amplified anti-gravitating dark energy density whose stress tensor is Tuv ~ (hc/\/Lp^2)guv where /\ is the amplified controllable Einstein cosmological variable and the Planck area is Lp^2 = hG/c^3.